Meet Humprhey! This fabulous knitted sockette puppet looks great with his orange, blue and red stripes, spectacles, bow tie and and his crazy red hair. He has a full working mouth with a squeaker in his tongue! Use as an excellent tool to encourage and motivate even the most shy children to practise speaking in a new language. Interacting with a puppet is much less intimidating for most children than interacting with an adult and even the most grown-up children will be desperate to "have a go" at practising new conversation skills with the puppet! 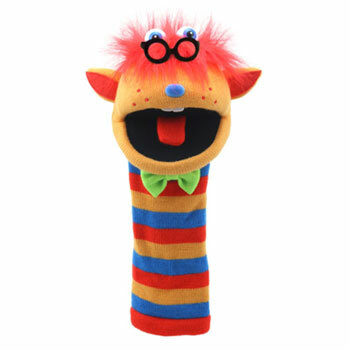 Superb materials and bright colours mean that this gorgeous puppet simply cannot be ignored!